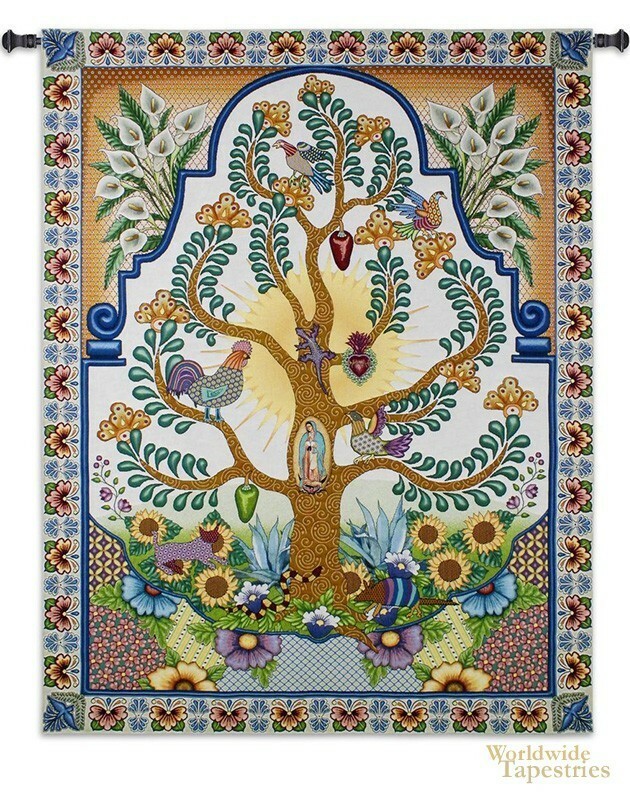 Arboles de la Vida tapestry shows the immortal tree of life with an abundance of colorful flowers. In Arboles de la Vida, Spanish for Tree of Life, we see tree of life with richly colored leaves and orange flowers, with birds such as roosters and doves. Sunflowers and lilies are seen to decorate the outer parts of the scene. An image of Madonna is seen in a cameo in the centre. A floral border completes the work. This Arboles de la Vida tapestry is backed with lining and tunnel for easy hanging. Note: tapestry rod and tassels, where pictured, are not included in the price. Dimensions: W 52" x H 68"